The ﻿﻿﻿Guide to Breastfeeding Support Resources in Delaware﻿﻿ ﻿lists various resources including hospitals, state programs, community-based organizations, private practice consultants and websites that can support Delaware mothers in breastfeeding. Recommend the LatchMe app to your patients to help them find Delaware resources for breastfeeding support. The ﻿American Academy ﻿of Pediatrics provides information for parents, health professionals and advocates of breastfeeding. 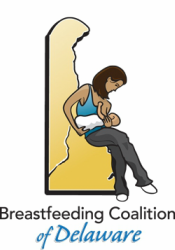 Here is a link to their ﻿﻿breastfeeding resources﻿﻿. The Academy of Breastfeeding Medicine is a worldwide organization of physicians dedicated to the promotion, protection and support of breastfeeding and human lactation. They provide educational tools for members of the various medical specialties. The International Lactation Consultant Association (ILCA) is the professional association for International Board Certified Lactation Consultants (IBCLCs) and other health care professionals who care for breastfeeding families. If you are interested in becoming a lactation consultant, or you are looking for information on supporting breastfeeding, this is the place to go. Below are some more resources you can distribute to expecting and new mothers and their families. Download and print yourself, request the files to send to a printer, or email us to find out if free hard copies are available.